September is the month for the season of fall (autumn). The fall is a time in which a new period of learning and harvest begins. Autumn marks the end of the long, hot summer, and offers us the opportunity to renew our family, social, and professional commitments. September brings us new colors on the leaves of trees and ushers in the fresh cool breezes that will cause the same leaves to … fall. Music is like life, which is like the seasons — it is based on cycles. 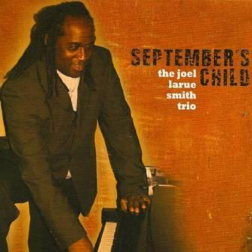 The compositions on “September’s Child” convey a certain amount of stylistic authenticity (staying in the correct clave) and strict song form. I have chosen to honor tradition while simultaneously bringing new influences into the music. There is no need to meticulously duplicate what the heroes of Latin Jazz have already done. My intent is to pay homage to the contribution of our past creators of this outstanding music, but to move forward and hopefully create something bold and new. The music on this CD is a combination of seven original compositions and four original arrangements of compositions written by Mario Bauza, Pedro Flores, Armando Peraza and Wayne Shorter. September's Child” is a masterpiece of a recording offering a palette of Afro-Cuban rhythms with a touch of the classical and slice of straight jazz making for one compelling debut. Joel Larue Smith and his Latin combo deliver one enchanting session of Latin jazz with harmonic and accessible grooves that's pleasing to the core. As “September's Child” unfolds, the sweeping musical journey begins as well, as does the harmonic and rhythmic connection that enjoins continents. It is the remarkable nature of Joel LaRue Smith's pianism that becomes the binding glue of it all. His music on this his debut record is sinewy, spectacularly sensual and joyfully spirited. Not just his interpretations of the Latin classics "Barandanga" by Armando Peraza, "Mambo Inn," by Mario Bauzá "Obsesión," by Pedro Flores, but more especially the music that he has written specially for this date. A recording head and shoulders above the crowd, Smith’s voice resonates strongly on September’s Child, clearly presenting his concept as a composer, performer, and arranger with focused intensity. His compositions dance around Afro-Cuban rhythms and traditional jazz ideals with a knowledgeable movement that reflects a solid foundation in both worlds. His ideas often place one foot in each genre, placing his compositions firmly in clave while the band interprets them with the loose freedom of swing. Cogent, conclusive, convincing, decisive, effective, forceful, persuasive, satisfying, strong, telling, pertinent, well founded, invincible, unbeatable, unconquerable, stunning, alluring, appealing, charming, delightful. These are words that will describe both how I feel about the piano artistry of one Joel Larue Smith...But, also my inclination that you the reader will take this colossal talent into your musical sensibilities if just for your enjoyment and edification!! Joel’s ability to write original jazz is nothing to be ashamed of either. By default, Joel is a highly literate and tireless proselytizer for the jazz idiom considering the strength of his music, his delivery, and his compositional skill to boot. I predict that the expressive and emotional scope of Joel’s pianistic skills will continue to grow impressively now and certainly in the near future. This set starts of in a very subtle way that makes you think you are listening to vacation music or music you’d hear in a restaurant that cares about presentation, but then something kicks in that makes you realize this is a cat that knows his stuff and is here to play. With it’s Latin jazz groove sneaking up on you, this is the kind of set that over takes you before you know what happened. Smith is a snazzy piano man that has jazz in his blood. He hits the notes cleanly and sharply giving his piano work a special place within the ensemble effort. Tasty stuff that piano fans have to take to heart. It is most appropriate that pianist Smith calls one of his original tunes here “Common Ground” – for this is a CD project that celebrates the wonderful intersection of jazz and Latin music, with a few hints of classical thrown in for good measure. Smith, who has largely flown under the radar, presents us with a gem. Virtually all of the material (principally originals) is from the Latin genre or has been re-arranged to take advantage of Latin energy and rhythms, and of course, the clave. He even reworked Wayne Shorter’s ballad “Fall,” first heard on Miles Davis’s Nefertiti recording, to give it an intriguing Latin flavor. The former Mario Bauza sideman also includes the Bauza classic “Mambo Inn” and Armando Peraza’s “Barandanga,” as well as Pedro Flores’ “Obsesion.” “Miramar,” “Narrow Escape” and the title track are standouts among the originals. Treats abound, thanks to the wonderful teamwork of Smith, bassist Fernando Huergo and drummer Renato Malavasi. Joel LaRue Smith's “Que Preciosa” is a gentle jazz ballad performed in the guise of a bolero. Smith’s solo piano introduction is a case of ten fingers conveying delicate thoughts. Bassist Fernando Heurgo and drummer Renato Malavasi join in this jazz lullaby. Heurgo takes an electric solo that is sometimes busy, but his extra notes do not diminish the mood. Smith meanwhile adds shades of color and Malavasi offers fine brushwork. Smith’s solo continues this act of tenderness. You can tell that he and his musicians are totally invested in this heartfelt composition. The intent can be heard in the touch. “Que Preciosa" meets the expectations set by its title. El Mensajero — Lots of stops and starts, changes in direction and tight ensemble playing mark this jazz Rumba. To be honest with you, I can't always tell one Rumba from another. (My guess is that this is a Cuban Rumba). But I know good music that is full of explorative improvising when I hear it. Pianist Joel LaRue Smith takes his solo to places I would not expect. Smith and his talented bandmates are all over the rhythms like white on rice. Rumba is about the communication of the dance. The energy, playfulness and motivation to get you moving are all strong elements here. This talented trio should be able to make anybody get off his or her seat.